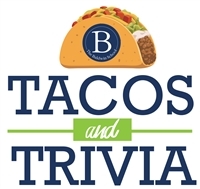 Middle School - "Tacos and Trivia"
Calling all MS families to join us for "Tacos and Trivia". Enjoy a full taco bar and friendly competition with your middle school families and teachers too! Tickets are $10 per person or $30 per family. $10 for an individual ticket. $30 for a family ticket.